A Foot Cramp is an involuntary contraction of muscles in the foot or feet especially the inner arch of the feet, toes and thigh and calf muscles. Pain is usually associated with the contraction of the muscle and even it has subsided one may still encounter aching. 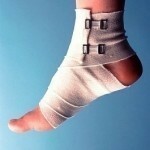 Some lifestyle related causes of foot cramps are obesity and lack of exercise. Conversely if exercise workouts become unexpectedly intense, this may result in added stress on the foot resulting in cramps. Also associated with intense work outs is the potential for insufficient calcium in blood supply which may also cause foot cramps. If muscle strengthening exercises are not done it may also result in foot cramps. Smoking and drinking alcohol will also result in poor circulation, toxicity and low oxygen supply in the blood therefore muscles will not receive what they need to perform normal muscle movements. If the diet is also unbalanced especially lacking Vitamin D, there is a likelihood that muscles and nereves in the foot will not function normally. Dehydration of the body’s most essential fluid water can also lead to muscle cramps in the leg. Additionally factors such as stress or tiredness in the feet because of overwork as well from wearing old footwear can make the feet vulnerable to cramps. Physical contamination of the feet from exposure to poisons or contaminated substances may also contribute to foot cramps. The feet may also be sensitive cramping from the intake of certain chemicals found in prescribed medication which may result in changing body conditions. Any of the above mentioned lifestyle and environment factors may easily affect the normal muscle functions in the feet. Foot Cramps may also be caused by high levels of magnesium which causes spasms. Unbalanced potassium levels which affect magnesium and calcium levels will affect the ability of muscles to contract normally resulting in foot cramps. Having flat feet or excessively active joints may also be a factor in causing foot cramps. The presence of an injury to the feet which is due to recurring muscle movements may also cause cramping. When there are changes in hormone levels in the body and the muscle tissue takes awhile to adjust to the changes in chemical production, foot cramping usually becomes likely. Medical conditions such as tendonitis, pinched nerves, plantar fasciitis, Parkinson’s, Huntington’s multiple sclerosis, diabetes tetanus and sickness associated with the nervous system and thyroid may result in foot cramps. Alone and in combination all the abovementioned factors may contribute to foot cramping.